I may be the painter (Artist) in our household, but my husband Adrian is most definitely the Photographic Artist. This weeks see one of his pictures become available to buy online from an Art store that sells prints and canvas prints. Adrian’s photograph of the yellow Lily is hanging in our hallway as a canvas, the photograph was taken in the Summer (2011) in our garden, we grew a bed of lilies this year and this was a beauty in the bunch. The photograph was accepted on the the Easyart website this week as part of their catalogue, it is also featured in the Next Art2order gallery for purchase as a framed print or canvas print. This week sees the launch of a new page on the Art In Wax website. Exhibitions is a new page that will be a unique space on the website for us to show different paintings and pictures not yet featured anywhere else. In the tradition of an exhibition they will be exhibits based on a theme and will be either painting in wax by myself or photographic art by Adrian Rayfield. The length of the exhibits will depend on the theme and whats coming up next …. so a place to book mark for future reference. Visit the exhibit now to view “An Explosion of Colour” a series of photographs taken in a studio setting using off camera flash lighting (strobist) set up. 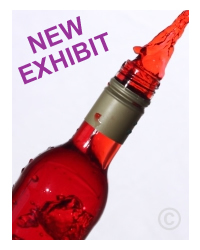 The bottles of coloured liquids have been lit to give a vibrancy and real WOW factor.